Painting Acrylic on Canvas | 44" x 54"
Painting Acrylic on Canvas | 34" x 60"
Painting Acrylic on Canvas | 48" x 54"
Painting Acrylic on Canvas | 52" x 48"
Painting Acrylic on Canvas | 18" x 48"
Painting Acrylic on Canvas | 78" x 63"
Painting Acrylic on 100% Acid Free Reg Paper | 60" x 36"
Painting Acrylic on Canvas | 54" x 36"
Painting Acrylic on Canvas | 16" x 48"
My strokes are distinct and bold to highlight god’s best creation. Every human being is a combination of colours and the different shades I paint are representative of the different moods of human beings. When I make paintings, my intention is to make people as well as me happy, hence I use bright colours. I also try to show the flow of life through my paintings. I think life is like a river which starts from the hilly area and flows down on the plains, collecting stones, soil and dirt which fertilizes the lands around it but burdens itself by doing so. Sometimes, it gets fresh water from rain or by any other small stream, which makes this river of life strong and powerful. Sekhar’s childhood wasn’t smooth due to political and socio-economic reasons. 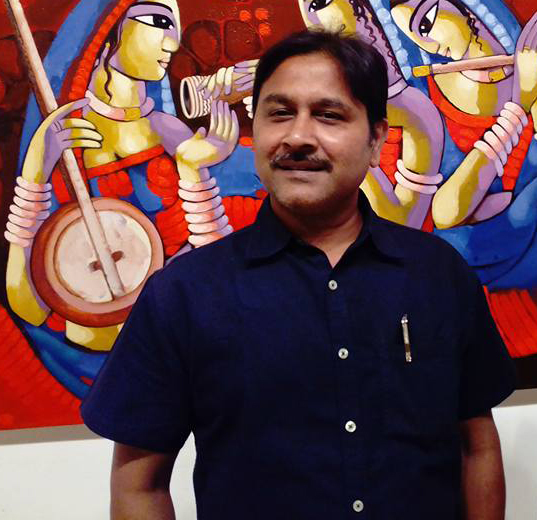 Sekhar has done eight solo exhibitions, participated in various group shows and camps in India as well as Dubai. In the year 2000, Sekhar won the honorable mention award (Kalashree) at the Lalit Kala Academy’s annual exhibition in Vishakapatnam. He is greatly influenced by Indian mythological characters, especially Krishna. To him, Krishna is a combination of love, passion and thoughtful mind. You can get to see those qualities in Sekhar’s paintings of Krishna. His signature style has bold and distinct strokes with bright colours that one can immediately associate with Sekhar. His paintings are generally shaded light and dark which gives his central characters a glow that makes them look ethereal.